I can't believe that Monday has come around so quickly again. It's time for me to plan my meals for the week. Last week's list didn't exactly go to plan, but it was helpful. I'd forgotten that I was going out with friends on Wednesday night, so that night's plan was scrubbed. I had macaroni and salad while chatting to my friends in our favourite pub and Graham and Cooper had the last of the soup. 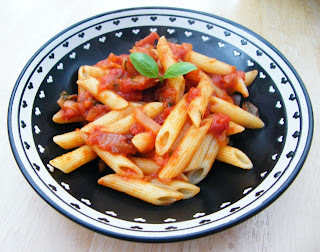 We had the stir-fry later on in the week and never got around to having the Pasta with Courgette Curry Sauce at all. Maybe that's a good thing. I'm working late and Graham is collecting Cooper from my parents, where he's been all weekend, so grabbing something simple after work seems like the best plan. 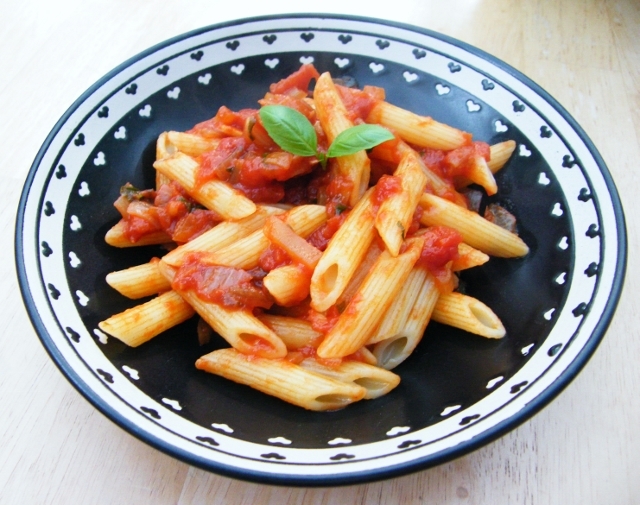 One of our favourite pasta sauces. So simple and fresh. We love it, but I haven't made it for ages and we get in late again tonight. 5:2 Diet fast day, so I will be having a small portion and no parmesan. Puff pastry topped with pesto and balsamic cherry tomatoes, served with a selection of vegetables. A mid-week feast. I'm on my 5:2 Diet fast today, so this is perfect. I've been tempted to make my own after trying one from Marks & Spencers. It was delicious and only 165 calories. The dressing was salad cream, something I haven't had with salad since I was a child, but it works really well with the egg and potato. For Graham I will make a dairy and egg free salad. I'm off today, so I'll have more time to make our evening meal, although Cooper and I will probably be out and about today. 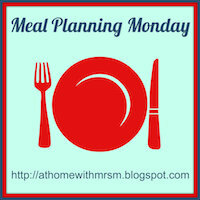 I am linking my Meal Planning post up with At Home with Mrs M who hosts this event. 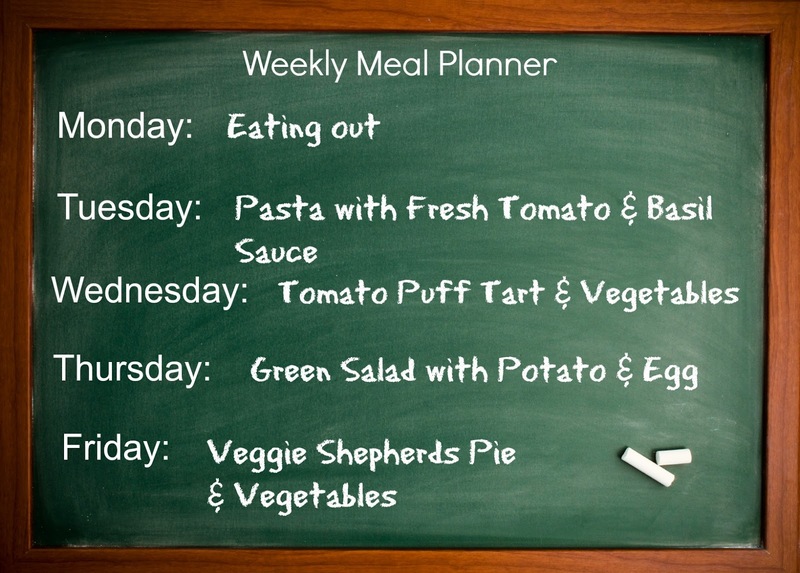 Do you have a meal plan for this week? I thought I would give it a go and see how it helps Rachel. Having weekends free and easy. Looks like a great plan! I'm going to improvise this week based on how much work I get done - more work = more time left over to actually cook something nice! I think its great to be so organized though! Oh well, never mind Tandy, it's not for everyone. Nice suggestion. I like the routine for a week. I will try it. I generally have a serendipitous (haphazard) approach to meal planning. I start with good intentions, write up a plan and shop for three days' worth, but sometimes my daughter comes home and declares she is too full from a big lunch, or hubby is massively delayed. What gets made can often do for the next day. Sometimes I just make extra of what I am making for my nutrition workshops and then I know it will be super healthy. We have fish twice a week, usually one salmon (often Japanese-ish) and one white (I like to do as tacos and Veracruz); tofu and bean based dishes the remaining days. Not much pasta as my daughter sometimes has this at school, but we get through a bit of quinoa and wholegrains (I like Pedon 10 minute packs for their 5-grain mix). We like spicy food so not much traditional British foods get made in my house! I plan meals mostly, but lately (because we've been on holidays) I've been eating out a fair bit and take-away and things ... but back on track tomorrow hopefully. You've inspired me Jacqueline! Your meals looks so healthy and lovely.